Thin-film solar grew 102 percent annually from 2006 to 2010, as costs fell. By 2009, thin-film reached 23 percent of total solar market share. By 2013, it should reach 30 percent. Over 160 companies currently compete in the thin-film space, with First Solar being the billion-dollar giant who is the cost leader with large-scale electric utility projects. Step price drops have been great for customers, but brutal for the 160 competing manufacturers. Investors now debate – Is thin-film more hype than hope, or will reaching grid-parity pricing cause breakthrough success for the leaders. GTM Research dives into the complex issues of cost curves, investor risk, and market demand, to forecast the future for the industry. Amorphous Silicon (a-SI) is forecasted to dominate with 5.8 GW over CdTE and CIGS with 2.4 each by 2012. An intense competitive battle is forming between the United States, Asia, and Europe. U.S. will grow all three thin-film technologies. A-Si will be the predominant production from China and Taiwan, but they will heavily fund R&D in CIGS which has already improved to 12 percent efficiency. 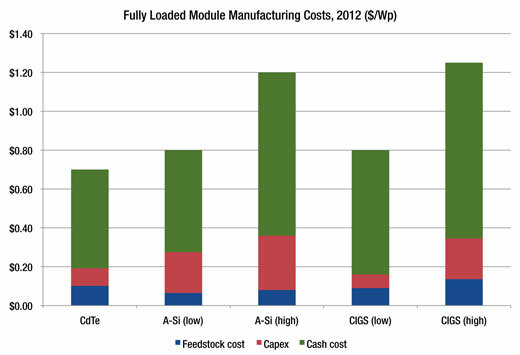 Module costs are forecasted to reach 80 cents per watt in 2012 for multiple technologies. Long-term only a few operationally-efficient manufacturing giants will enjoy large market share and reasonably margins. Other players will need to be adept in focusing on value-added applications, specific market segments, and system integration. As of 2010, only two thin film companies have produced in excess of 100 MW annually. The cost structure of most amorphous silicon, considering its low efficiency, is barely competitive with crystalline silicon, and CIGS producers have encountered technical issues in manufacturing that have forced most of them to delay commercial production, a situation which has persisted since 2007. To make matters more difficult, capital constraints led banks and developers to shy away from thin film in favor of more mature and abundant crystalline silicon modules for projects in 2009. Yet thin film will continue with high growth and market share gains. There will be winners, consolidation, and bankruptcies.